Just because these little towns don’t appear ancient doesn’t mean they aren’t. Ravello actually dates back to the 5th century and the centerpiece of the town, Villa Rufolo, was built in 1270 and has an amazing view of the coast. 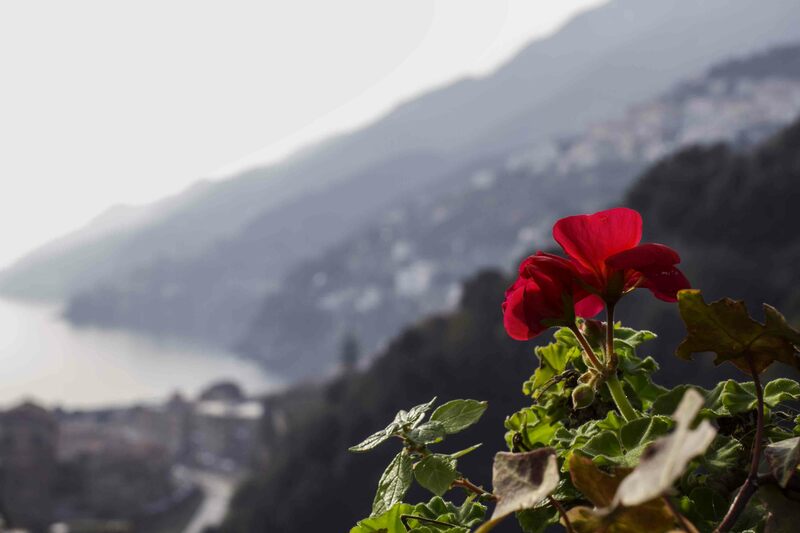 This photo, called simply Ravello, was taken with a Canon T3i and an 18-55 Kit Lens in Ravello from Villa Rufolo. This was taken in October of 2011 when the skies are typically like this in fall and winter making it great for taking photos. Vietri sul Mare is a fun stop along the Amalfi as well. It differs in many of the other Amalfi towns in that it is just a few minutes from the main autostrada. Vietri sul Mare is known for its pottery and ceramics, deals can be had in the off season. This photo, called The Amalf, was taken with on a Canon EOS 7D with an inexpensive 40mm f/2.8 “pancake lens.” The “pancake lens” is just 2.7 x 0.9 inches and weighs in at a whopping 4.6 oz! This lens is a great option if you want a small lens for walking around without drawing attention. The town of Amalfi is the perfect destination for an overnighter if you’re in the area. A big part of Amalfi Coast towns is the food, and great restaurants are everywhere. In The Ristorante at left, I wanted to capture the spirit of an evening out in Amalfi. I hoped to catch people in motion at their tables. However, this was more difficult than expected with tourists and waiters passing by. This 15 second exposure was taken on a tripod with a Canon T3i and a Tamron 28-300mm lens. Whether you’re traveling to Italy or already live here, the Amalfi Coast is an amazing adventure. Finally, if you think you need great camera gear to take a decent photo while on the Amalfi, guess again. The first photo at the top was taken in 2006 with a Sony pocket camera, the Cybershot DSC T-100 (below). 1. UNESCO World Heritage Center, Italy, 2014, http://whc.unesco.org/en/statesparties/IT/ (accessed February 18, 2014).